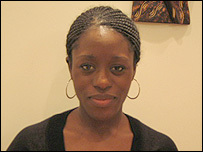 Each year British children born to Ghanaian parents are sent to school in their country of origin. BBC News visited expat pupils in Accra to find out how they fit in and why they were sent. "Going to school in Ghana is like being in prison," says 19-year-old Samuel Afeeva, with a sly smirk. Pupils are motivated because they do not want to "look stupid"
The five mainly teenage boys seated either side of him nod in agreement at the soundbite from the elder statesman of Faith Montessori's British community. The youngsters, who are all from London, tell stories of gang culture, classroom misbehaviour and rows with parents to explain their "incarceration". Samuel, from Woolwich, is only now completing his GCSEs because he simply did not attend school for two years. But just as he seems set to continue by describing the petty injustices of school life, his sermon takes an unexpected turn. "This is like a mental prison - it disciplines your mind," he says. "When you get out and go back there's no way you can flop. We've seen what happens if you fail." 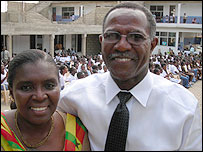 He says the stark inequalities of life in Ghana showed him the difference education could make. Aaron Gyening, 17 and a fellow exile, agrees. "Over here you see rich and poor people. It makes you want to get somewhere in life," he says. "You don't want to be like the poor people who end up sweating in the sun and sleeping on the roads." Despite the thick African accents that fill the school's busy corridors, Aaron and his friends remain fluent in the slang of London's streets and see themselves as a distinct group - despite stressing that fellow pupils and teachers welcome them. 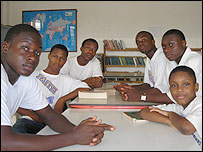 Although English is the language in which all lessons are taught, pupils come from all over Ghana and speak their local dialects - forcing the Britons to learn these languages. Most British students who are sent to the country study there for two or three years before returning to the UK to sit GCSEs or A-Levels. Aaron and his friends feel they are often unfairly blamed when belongings are stolen from boarding students, or fights break out. But they concede that their cause has not been helped by the fact that three of the 12 British boys who started the academic year were later expelled for carrying knives. The boys say their experiences in Ghana are completely unlike those they are accustomed to in the UK. "In London, if you aren't scared of anything and act like a gangster you're popular. As long as you've got girls, money and your crew, you're fine," says Crispin Antwi, 15, from Camberwell. "Over there if you do well people call you a boffin. "But in Ghana everyone is given a position in class depending on how well they perform and you don't want to be last because you'll look stupid." Department of Education statistics, leaked to the press in December, suggest that black pupils in England are three times more likely to be excluded from school than other students. And latest GCSE results show black pupils in the UK continue to lag behind their counterparts. Meanwhile, a spate of fatal shootings in London where the victims were teenagers points to the violence hinted at by Crispin. The differences between the expat pupils and Ghanaian children are noted by Oswald Amoo-Gottfried, who founded Faith Montessori, which caters for about 650 boarders and day pupils. He welcomes the British contingent and blames any aggressive tendencies on the UK's work culture. "Children need their parents around to teach them right from wrong. But I've found that often both parents are working and youngsters grow up in front of the television and the internet with no-one to supervise them." He cites this as a major reason why some Anglo-Ghanaians choose to send their children away. Mary Buapim is one such parent. She sent two of her four children to Ghana. The care manager from Coulsdon, Surrey, feared that her eldest child, Michelle Asante, was being influenced by an "irresponsible" friend and wanted her two girls to know their cultural heritage. "I also wanted them to meet children who didn't have the same opportunities that youngsters in the UK take for granted," she said. "They learned to concentrate on their studies and benefited when they returned." Ms Buapim also felt the use of corporal punishment instilled discipline in her daughters. Her daughter Michelle, now 23 and an actress, looks back with fondness on the year she spent at Archbishop Porter's Girls School, in Takoradi. "The work ethic has stayed with me ever since I returned," she said. She went on to complete a sociology degree at the University of Sheffield before attending drama school. But she was quick to point out that not everyone who makes the journey is as lucky as her. For example, her sister was bullied and struggled to curb her temper in the face of a more authoritarian teaching style than in the UK, she said. "It was easy to get lonely and a lot of people cried, but it was a great experience for me and I wouldn't have had the determination to go to university and pursue my dream of being an actress." Back at Faith Montessori the British boys are plotting their futures and competing with one another about who will make the most money. Isaac plans to be an architect, and 11-year-old Karim wants to open a fast food franchise. Meanwhile, Aaron simply wants to be "the proprietor of a big time business". Samuel - who will return to the UK in July - has the last word: "The money can wait. I'll train to be a biochemist."